A kaleidoscope of vibrant colours, green nature and delicious tastes is at the heart of Kerala. From the now iconic Backwaters to Green Wayanad and mountain nature reserves, the intensity and variety of nature provides a glorious context for the varied cultures, tastes and history of Kerala. 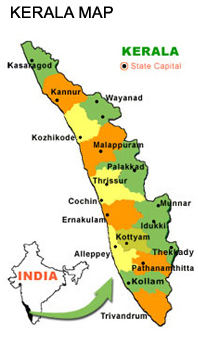 Malayalam is the most widely spoken and official language of the state. The region has been a prominent spice producer and exporter since 3000 BCE, remaining an international spice trading centre till today. In the 15th century, the spice trade attracted Portuguese traders to Kerala, and paved the way for the European colonisation of India. The state has the highest Human Development Index (HDI); 0.790 in India according to the Human Development Report (2011). It also has the highest literacy rate; 93.91%, the highest life expectancy; 77 years and a survey in 2005 by Transparency International ranked Kerala as the least corrupt state in India. The state has witnessed significant emigration of its people, especially to the Gulf States during the Gulf Boom of the 1970s and early 1980s, and its economy depends significantly on remittances from a large Malayali expatriate community. Hinduism is practised by more than half of the population (58%), followed by Islam (24%) and Christianity (18%). Production of pepper and natural rubber contributes to a significant portion of the total national output. In the agricultural sector, coconut, tea, coffee, cashew and spices are important. The state’s coastline extends for 595 kilometres and around 1.1 million people of the state are dependent on the fishery industry. In the south-west region of India on the Malabar Coast, Kerala is full of vibrant colours and lush nature, hills, backwaters tropical greenery and wildlife. 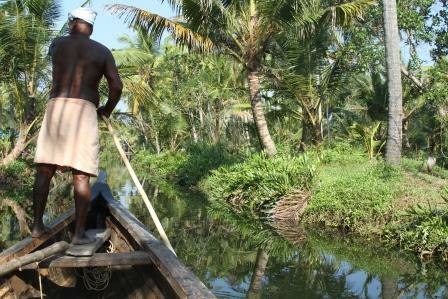 It is possible to visit Kerala all year round. Kerala does not have a dry season or winter found in other parts of India. For most of the year it averages around 30˚C during the day and 20˚C at night. It can be warmer in April and May before the monsoon. The monsoon season between end of May/early June to mid-September may mean that getting around can more difficult but it can be an exhilarating time with nature lush and green. The best time to visit is between December and February when there is limited chance of rain and it is less humid. Kerala is very close to equator and has a tropical climate, it experiences heavy rains almost throughout the year, and is one of the wettest places on the earth. Summer lasts from mid-February to mid-May. It is hot and temperatures can go up to 35°C in the afternoons. The monsoon is in place from mid-May until early September. The North-East Monsoon winds bring heavy showers. Mid-October to early February can bring a mild ‘winter’ in the hilly areas, which can get cool and misty. The weather, however, remains hot on lower ground. Heavy rains occur from the last week of September until early November, due to the retreat of the South-East monsoon. In hilly areas of the Western Ghats temperatures may drop down to 10°C or sometimes even little below during Winter seasons (November, December) , especially at popular hill areas like Wayanad, which may result in misty days and comparatively chilly nights coupled with light cold showers. However in other places, the temperatures never drop below 20°C. Recently summers have become hotter. Though the maximum temperature on summers has never risen higher than 36°C, the rising humidity has made recent summers difficult. 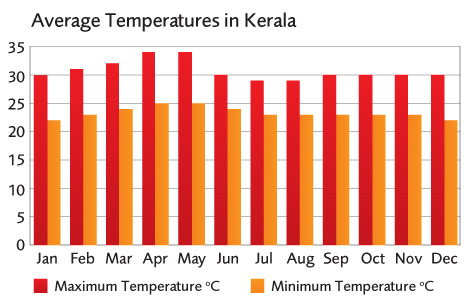 The height of the Kerala summer is normally between mid-March and May. Delicious, just about sums it up! The cuisine of Kerala is linked to its history, geography, demography and culture. Kerala cuisine offers a multitude of both vegetarian and non-vegetarian dishes prepared using fish, poultry and red meat with rice a typical accompaniment. Chillies, curry leaves, mustard seeds, tamarind and asafoetida are all frequently used. Kerala is known as the “Land of Spices” because it has traded spices for centuries. Food is traditionally served on a banana leaf and almost every dish has coconut and spices added for flavour, giving its cuisine a sharp pungency that is heightened with the use of tamarind. Fish and seafood are the main diet in coastal Kerala, whereas vegetables and pulses are the main diet in the rest of the State. See for yourself on Flickr!